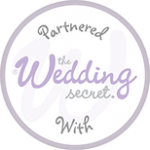 Pierre and Anneka had tons of imagination and the ‘can do’ attitude to go with it. 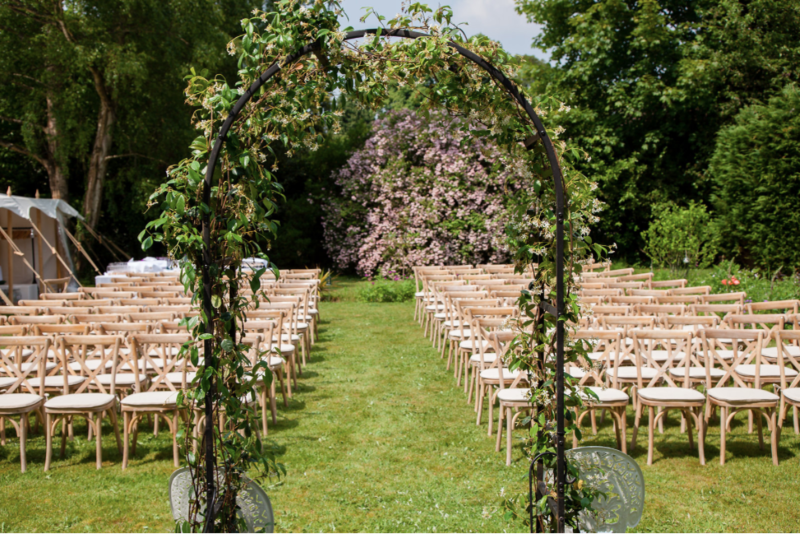 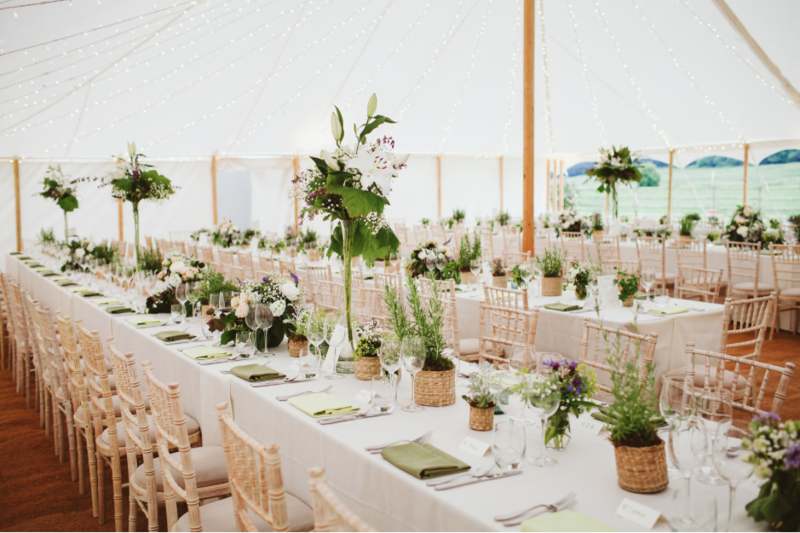 This wedding was organised in a very short time scale and the end result was superb. 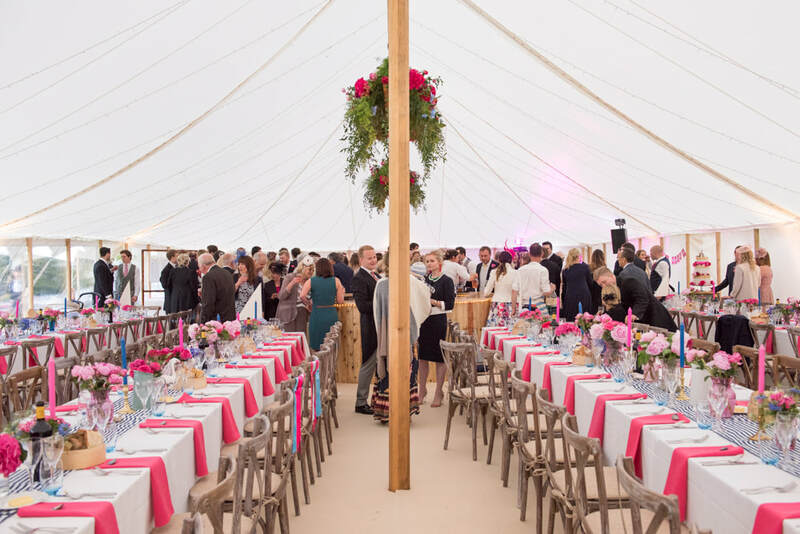 They invited 130 guests. 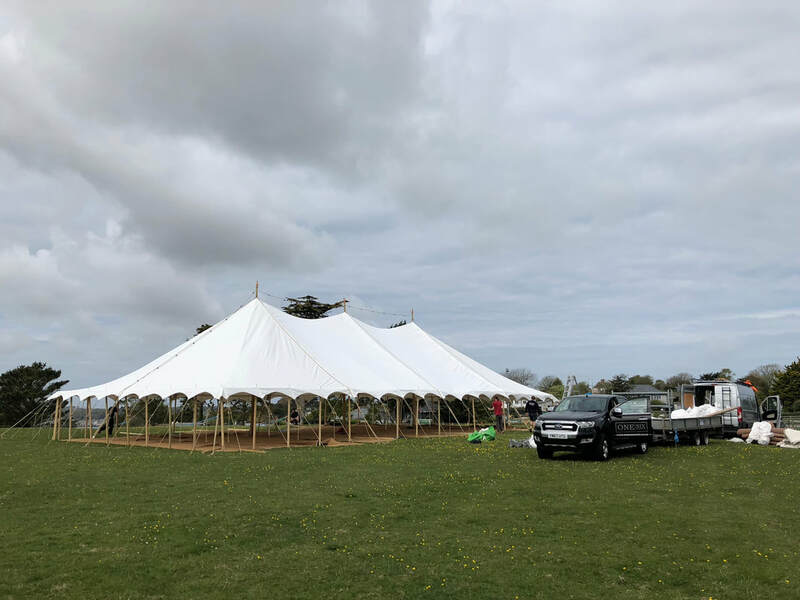 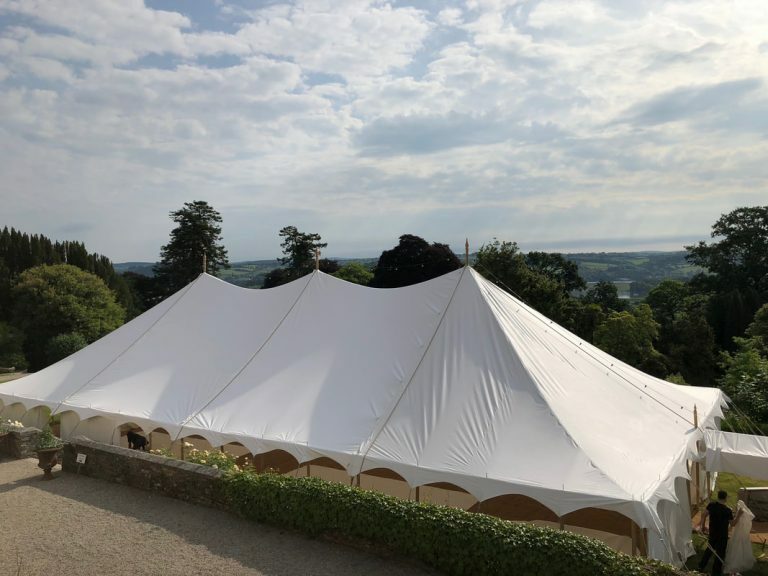 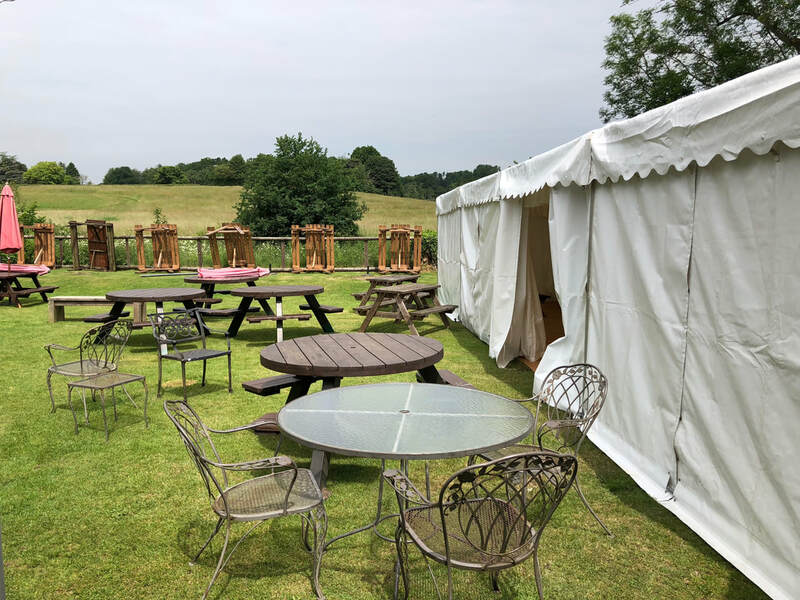 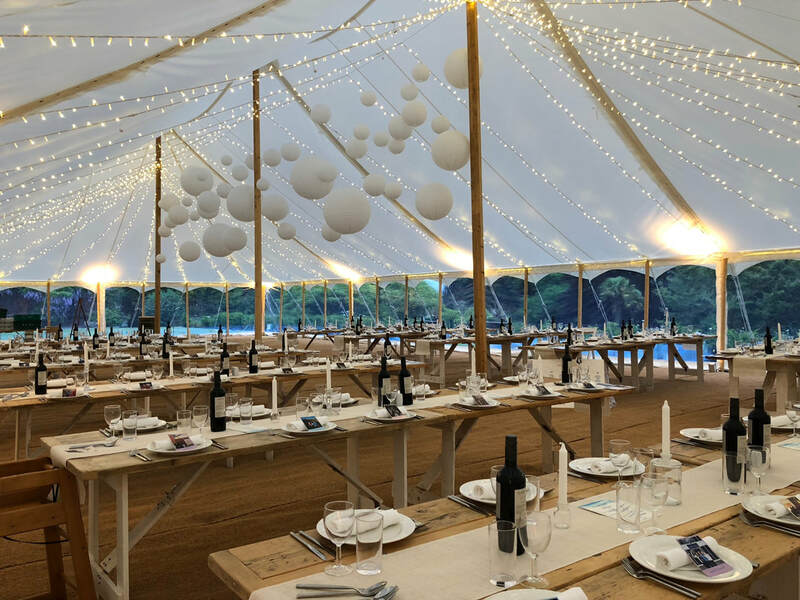 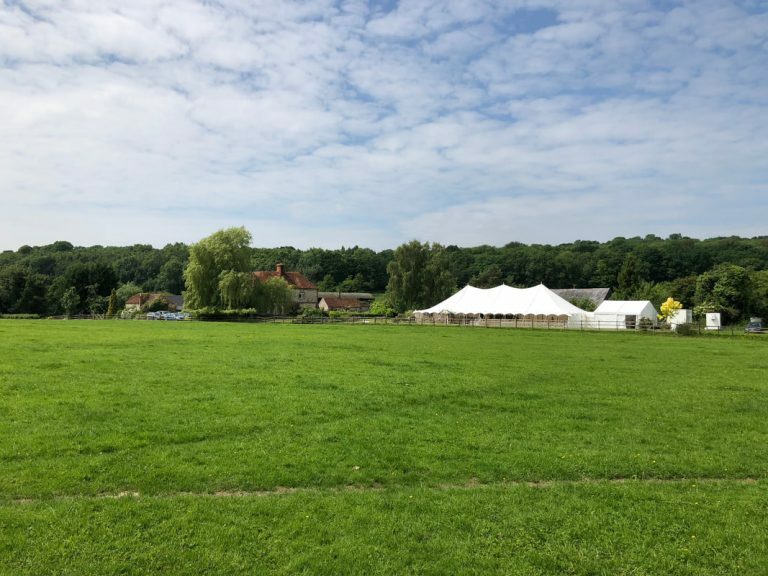 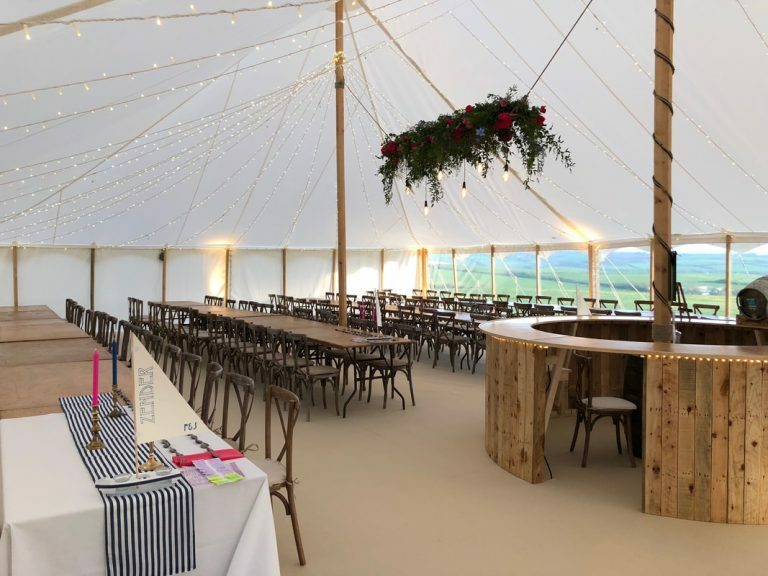 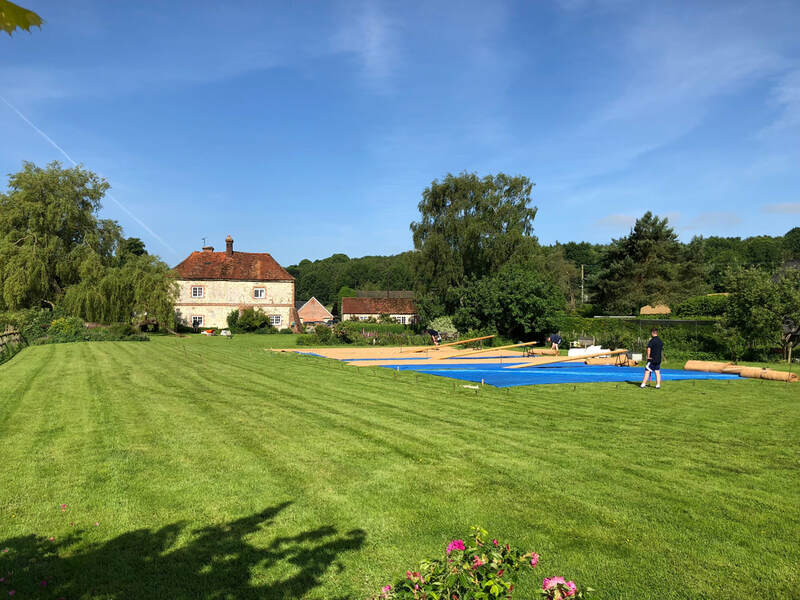 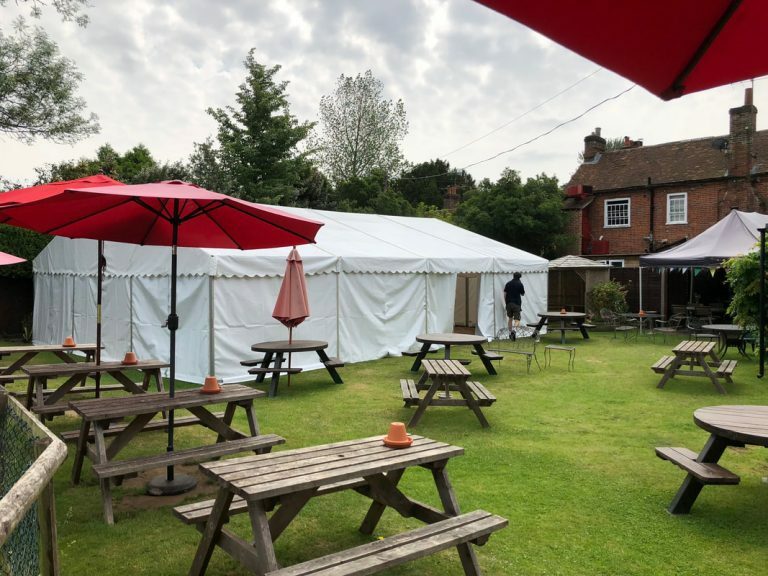 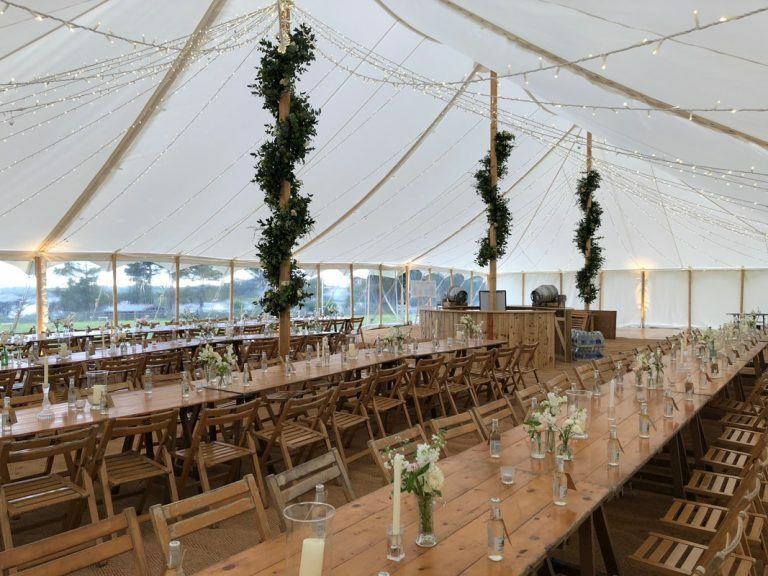 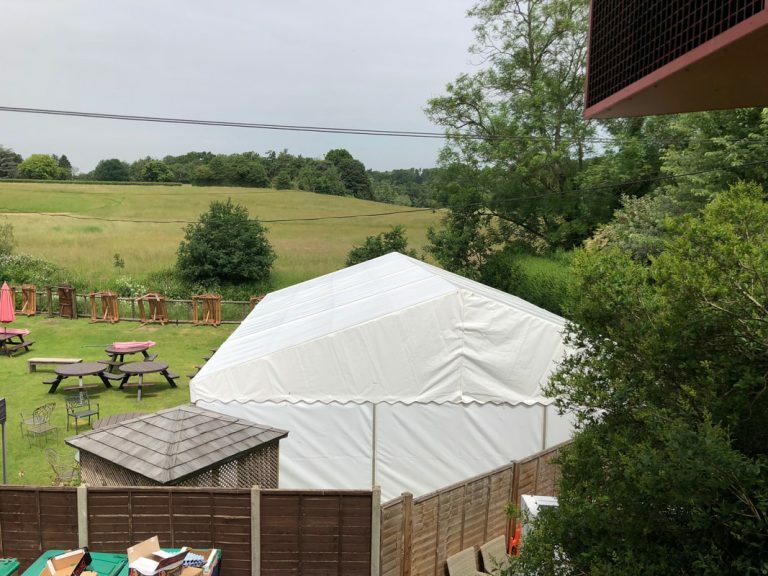 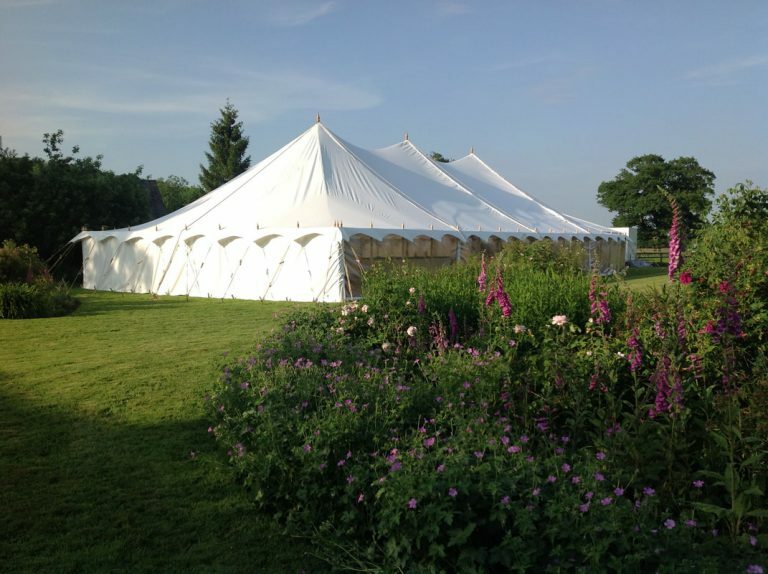 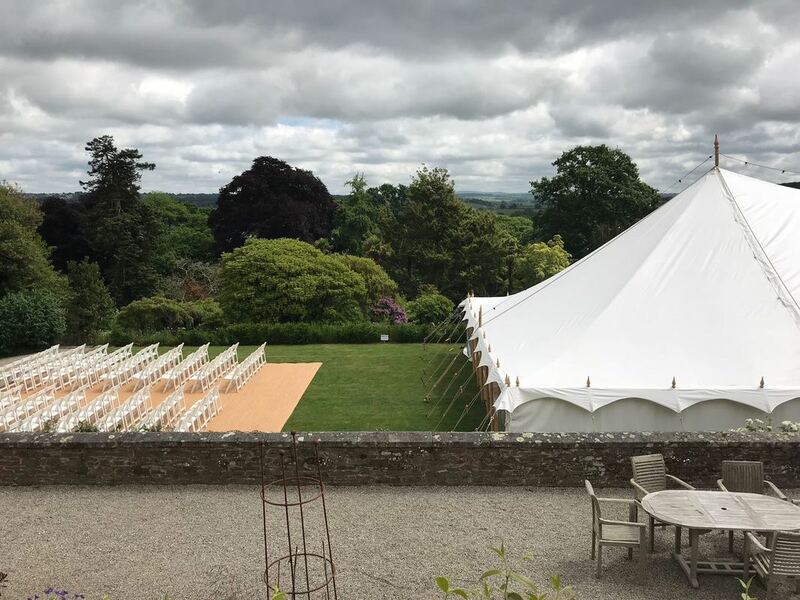 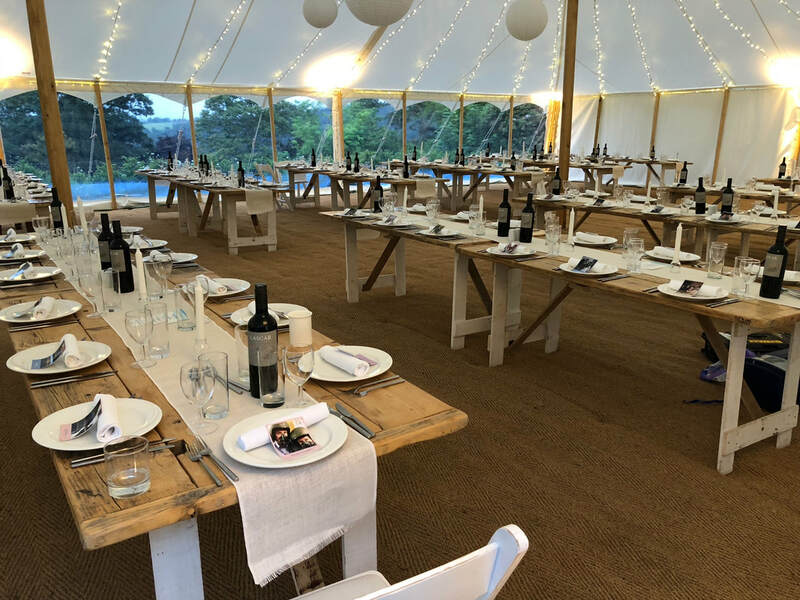 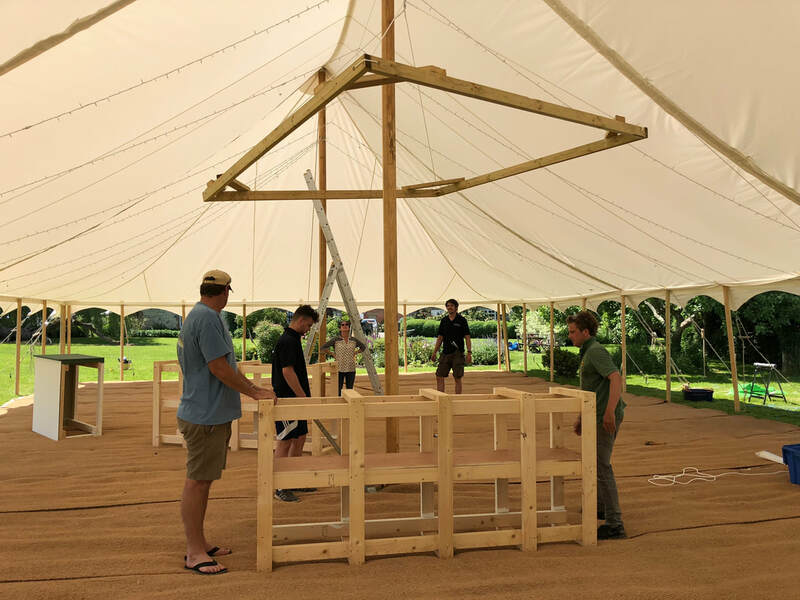 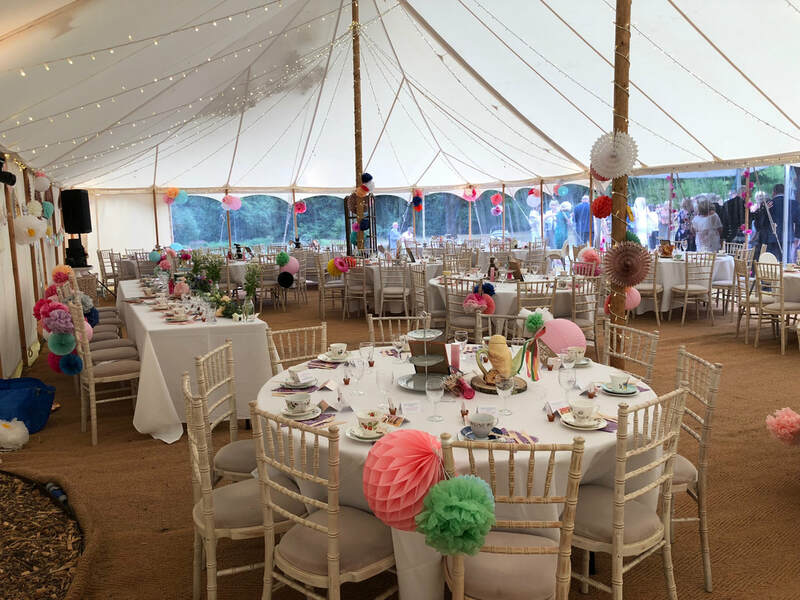 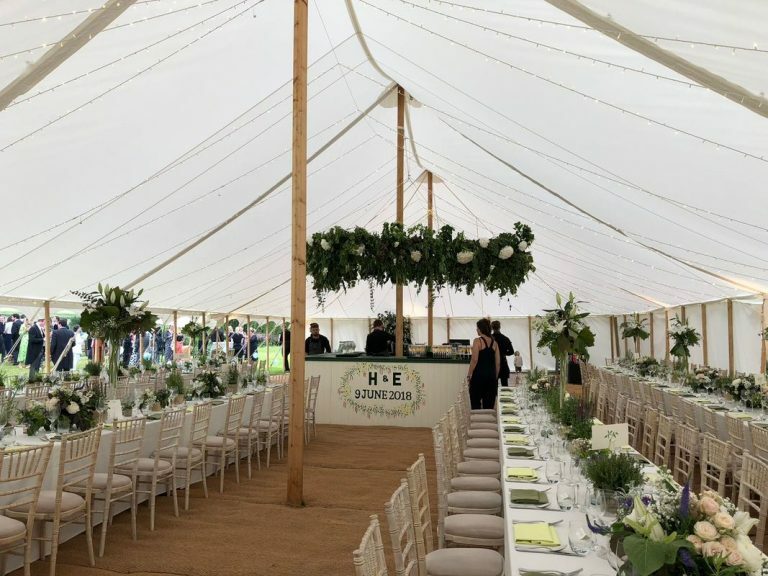 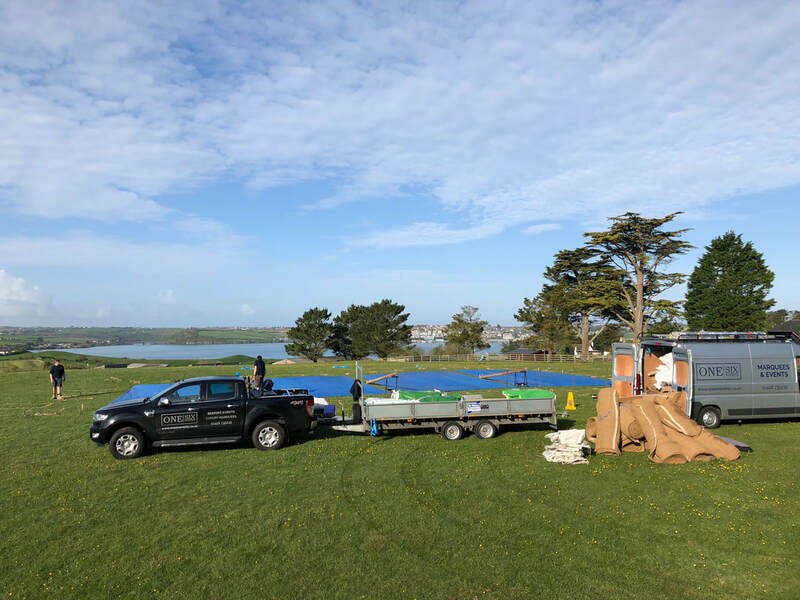 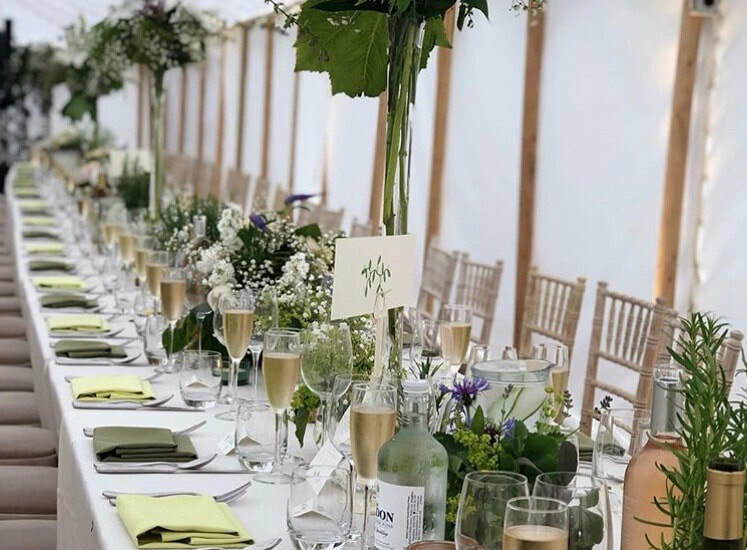 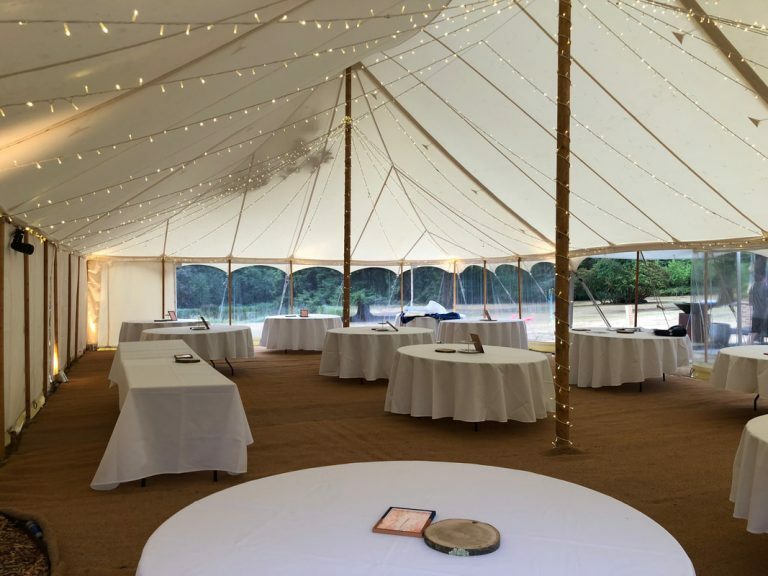 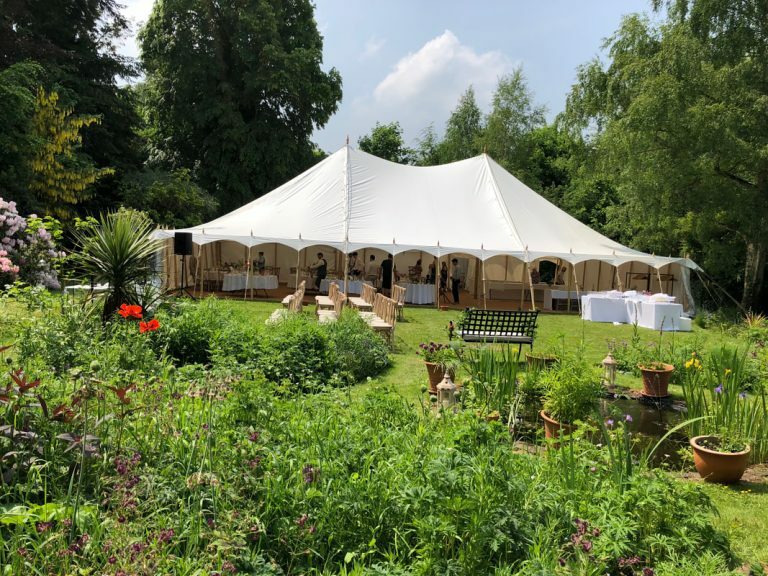 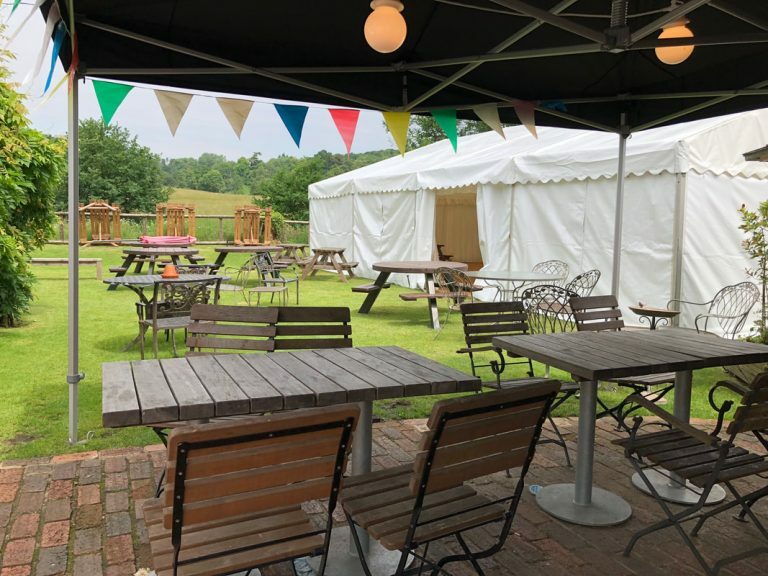 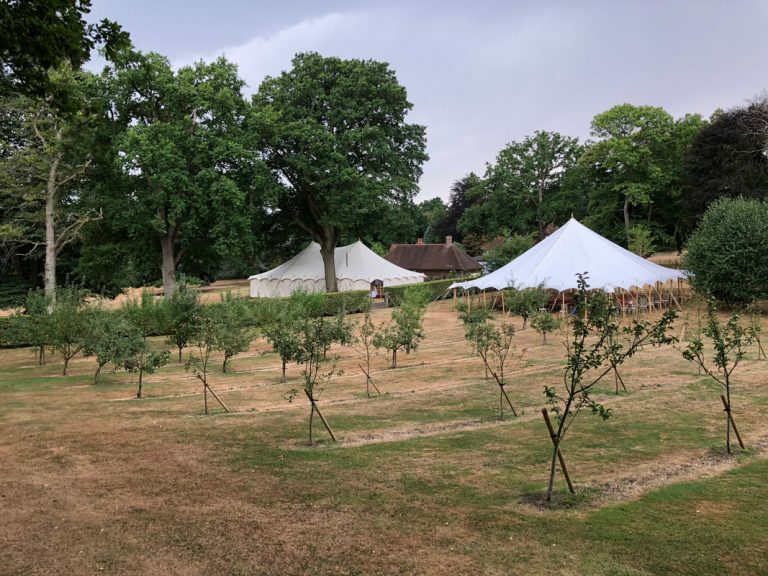 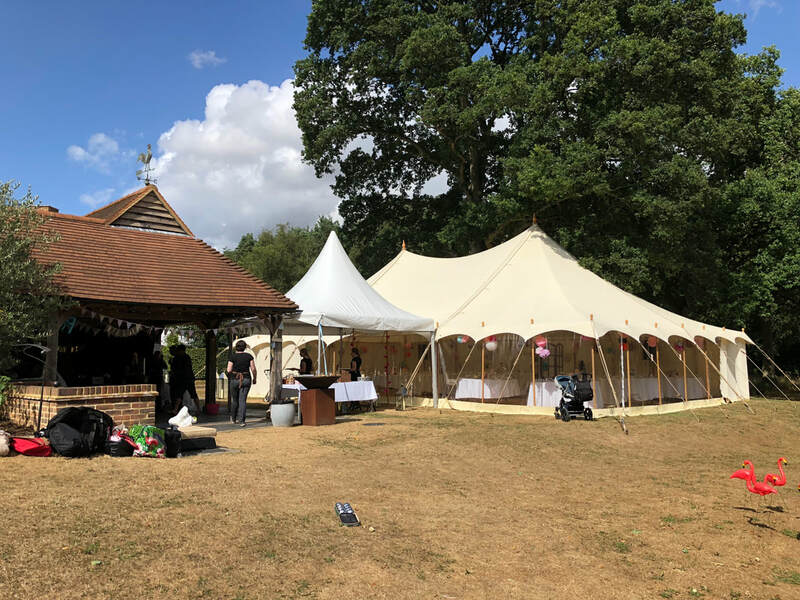 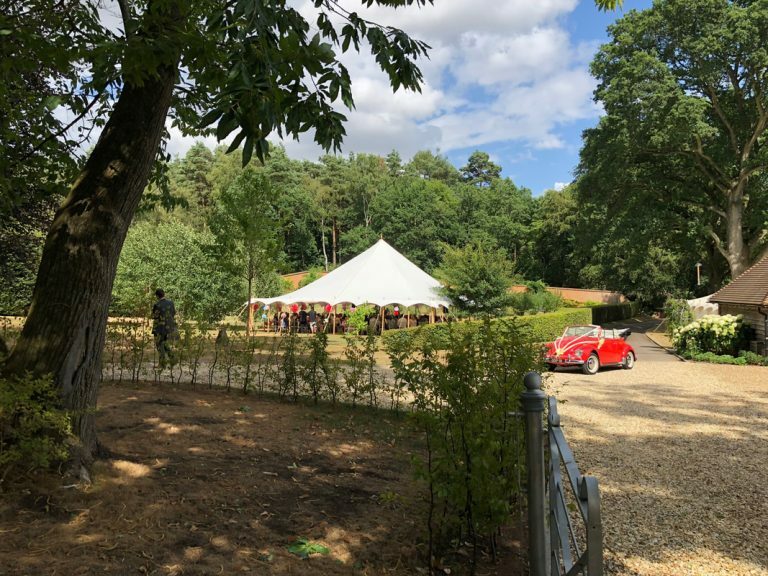 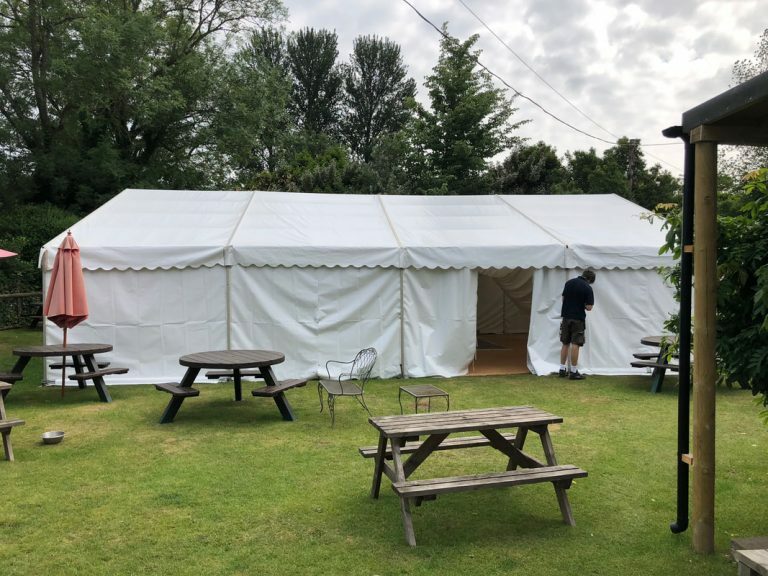 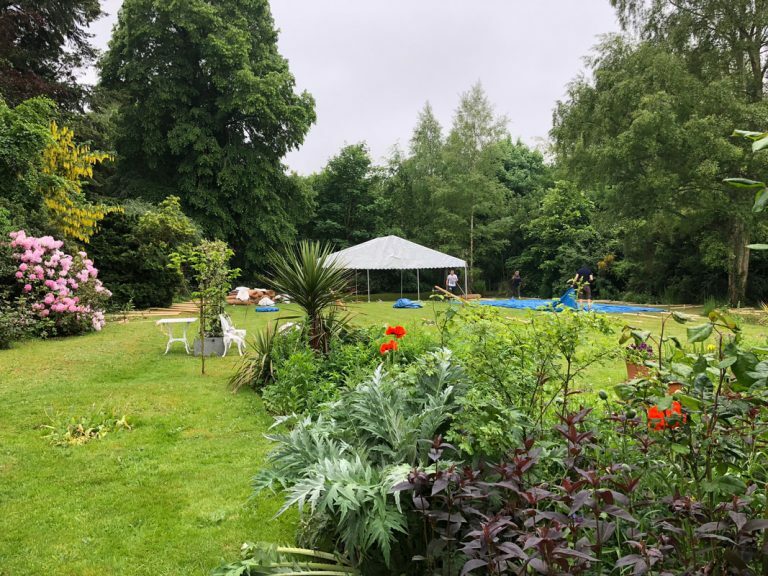 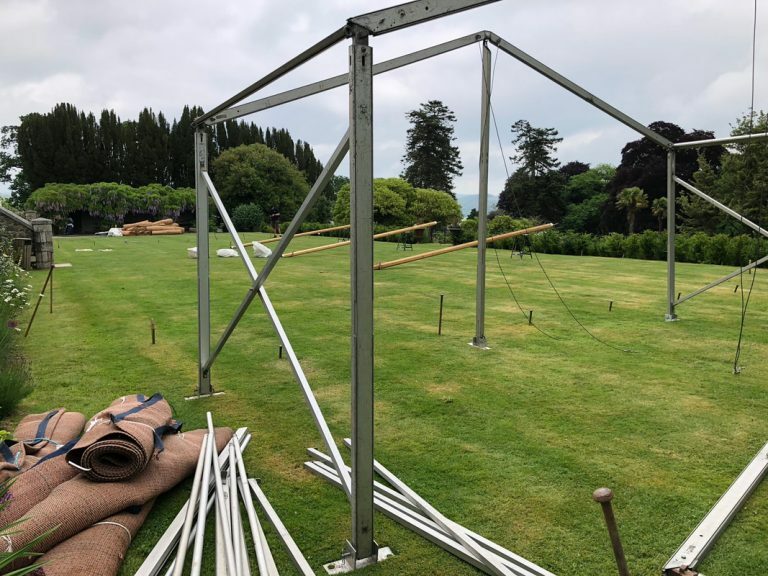 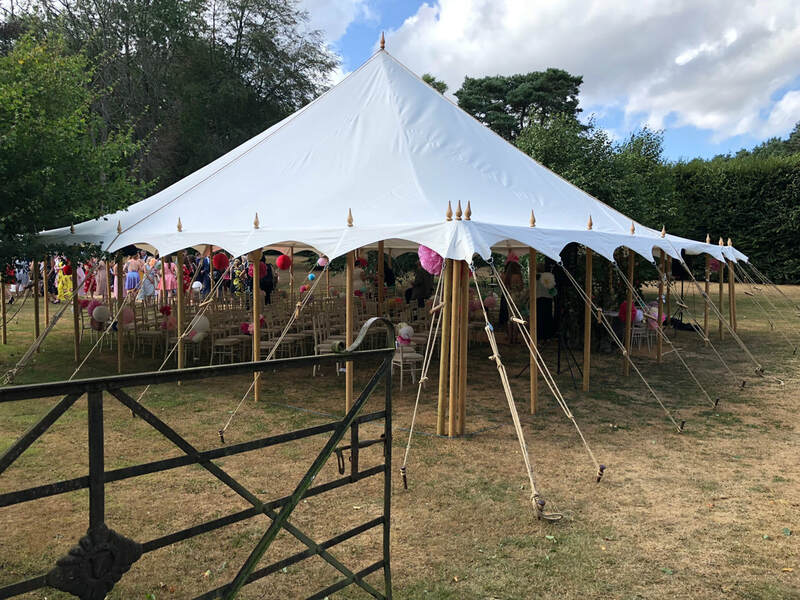 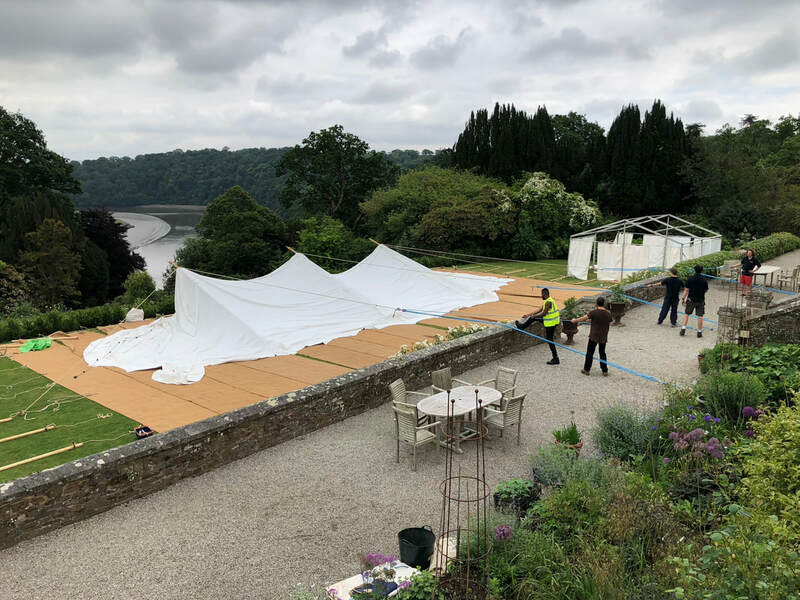 We were pleased to supply and install a 9 metre clear span marquee which was used in a country pub garden to hold a corporate function. 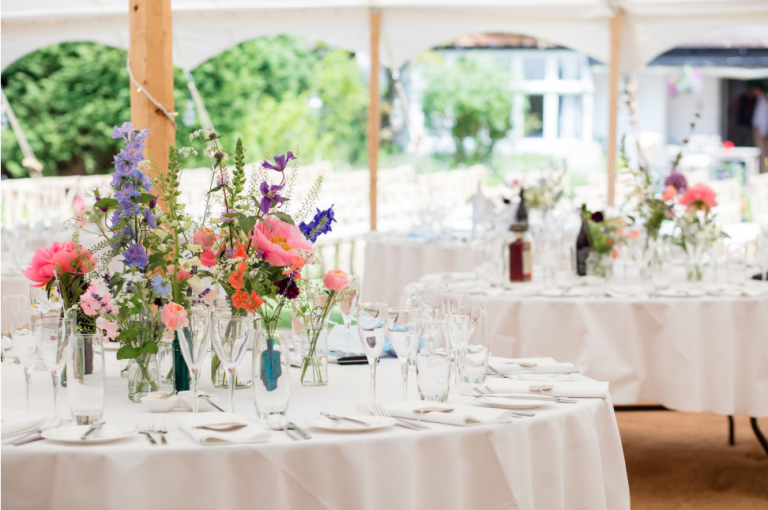 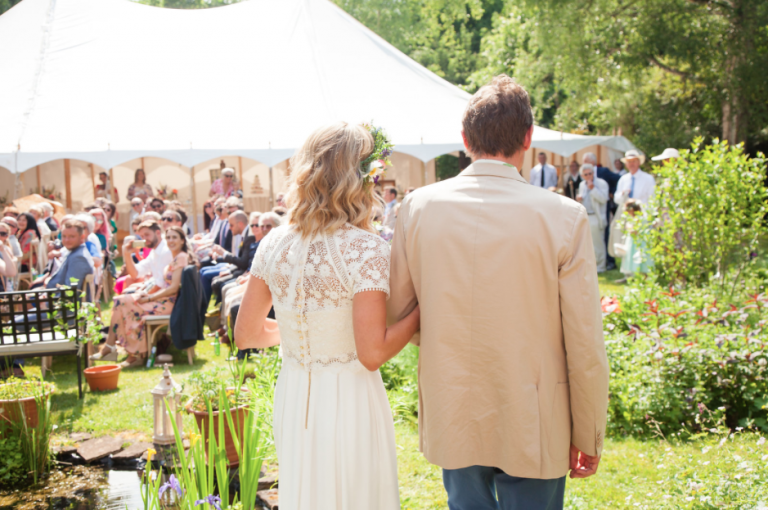 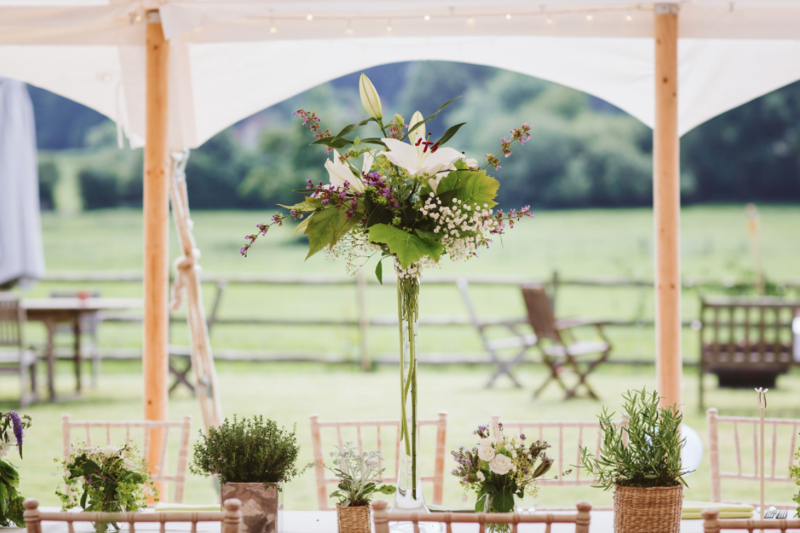 Edward and Hattie opted for a traditional country wedding on the family farm in Hampshire. 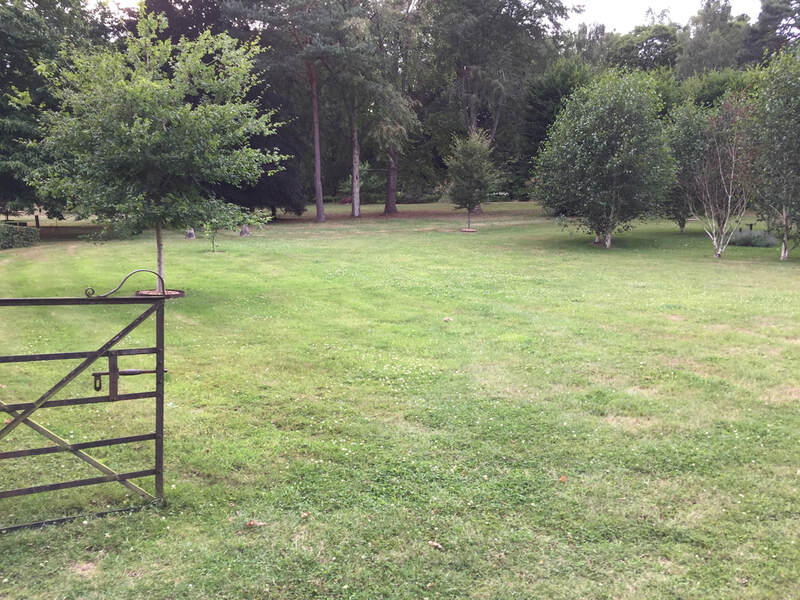 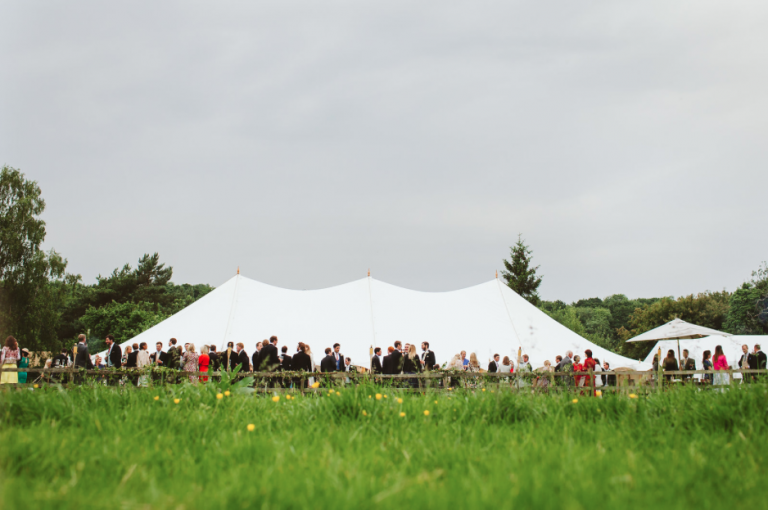 The surroundings made it easy to achieve the clients brief. 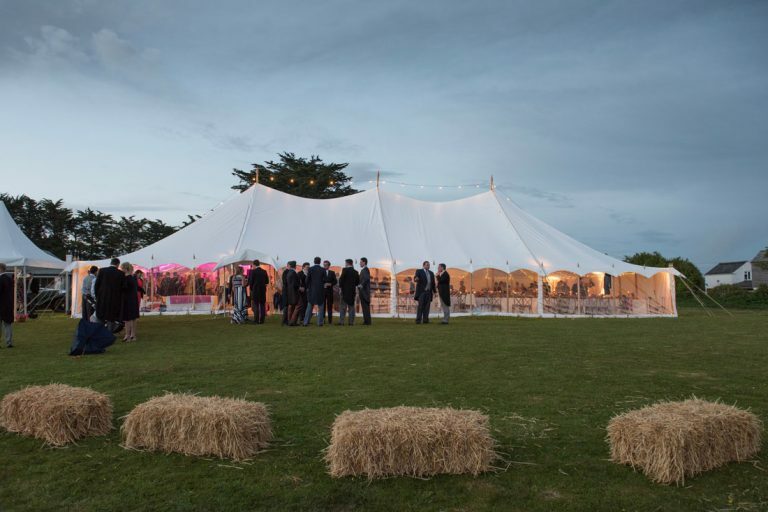 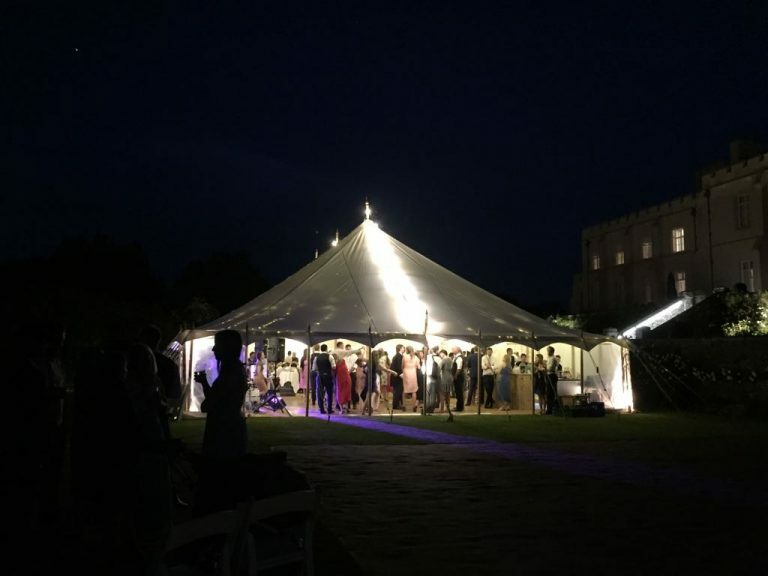 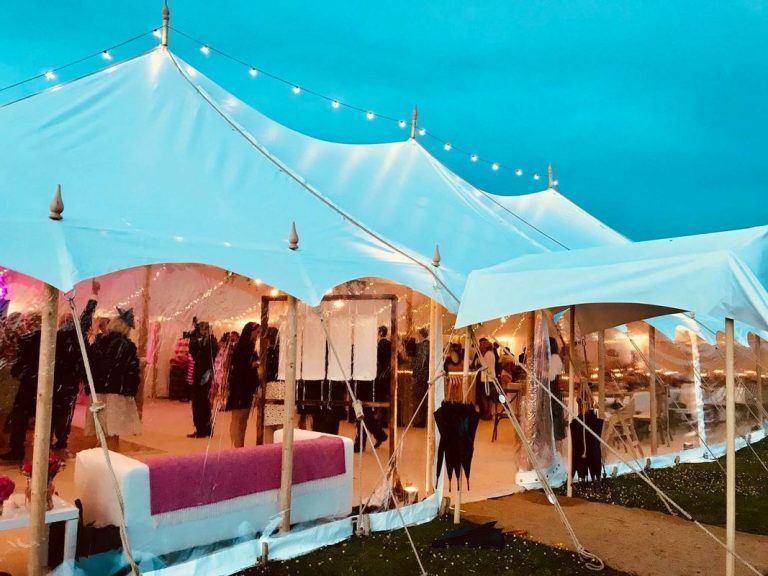 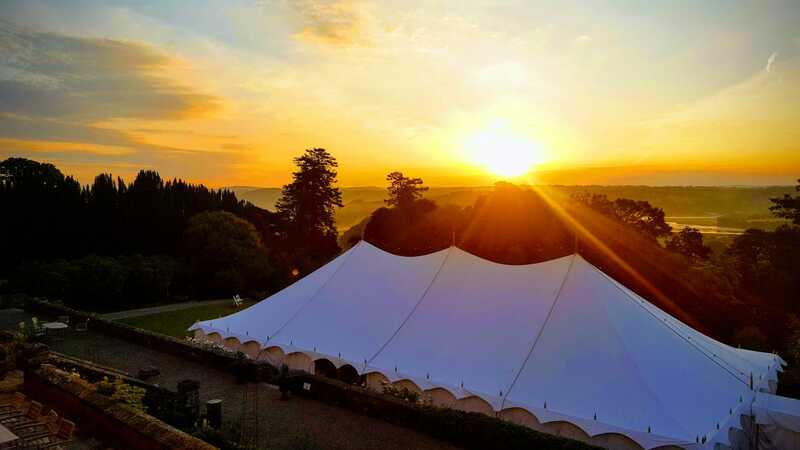 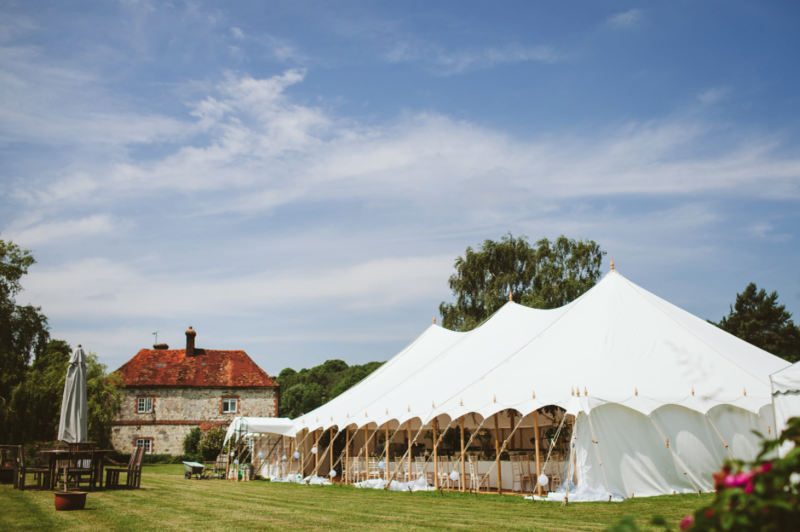 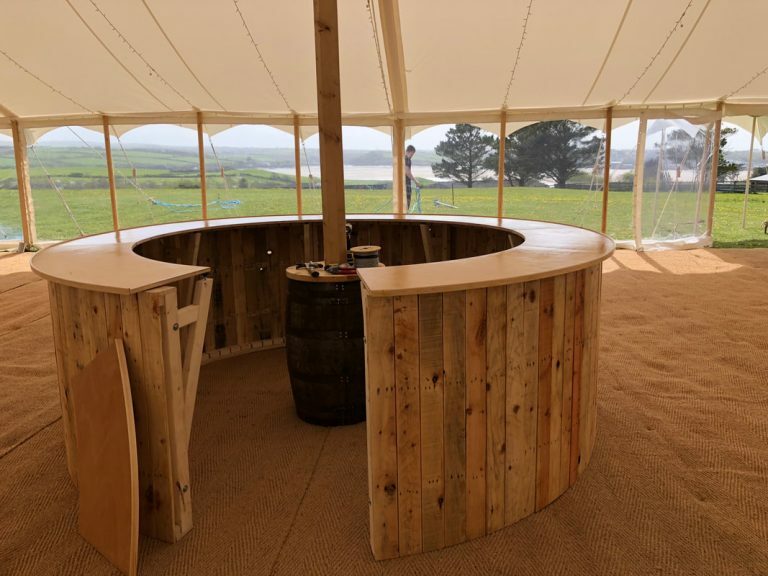 This marquee held 170 guests with space for dancing and the rather stunning bar. 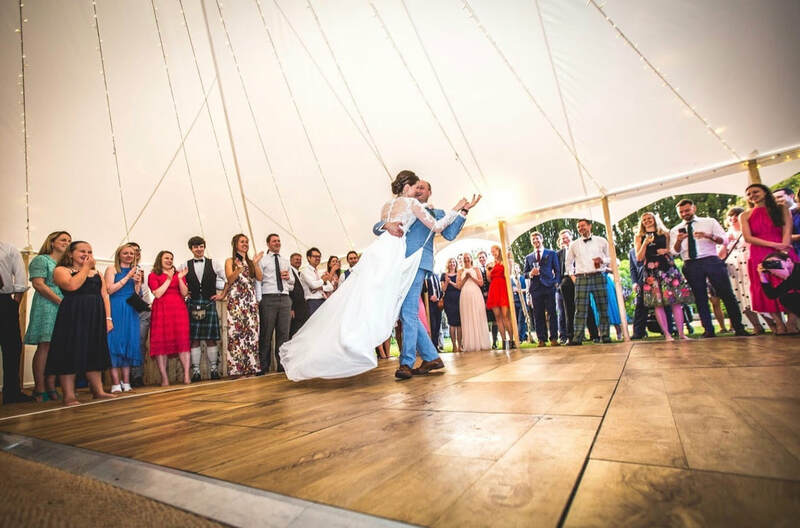 Josh and Jess celebrated in style and opted for the festival theme. 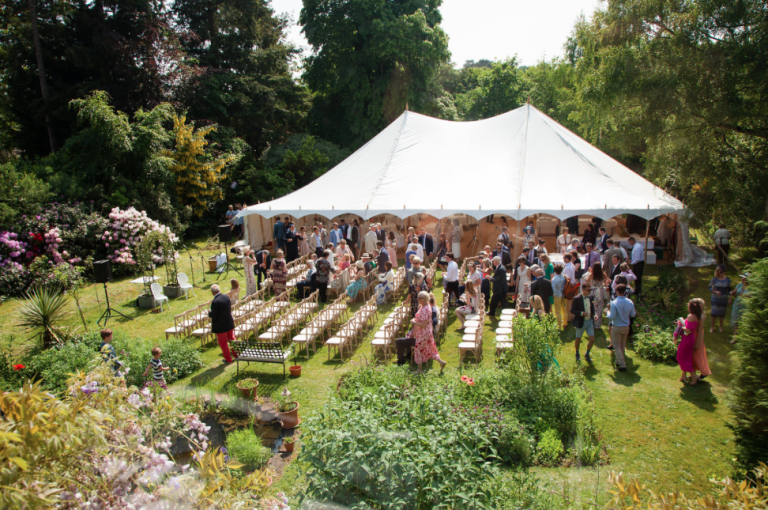 The guest list was 130 and comprised two Petal Pole marquees and three pagoda’s. The two main marquees were for the ceremony and dining and dancing. 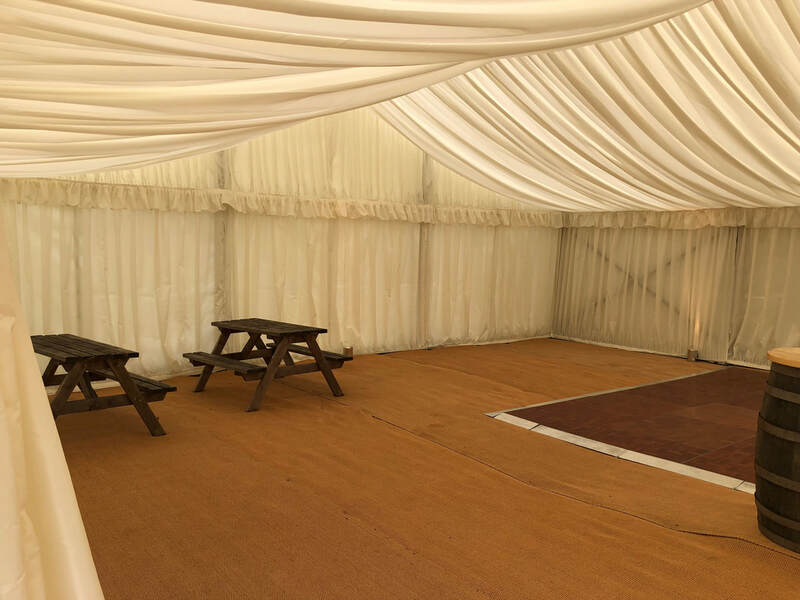 The pagoda’s housed the food and booze vehicles with further festival themed furniture. 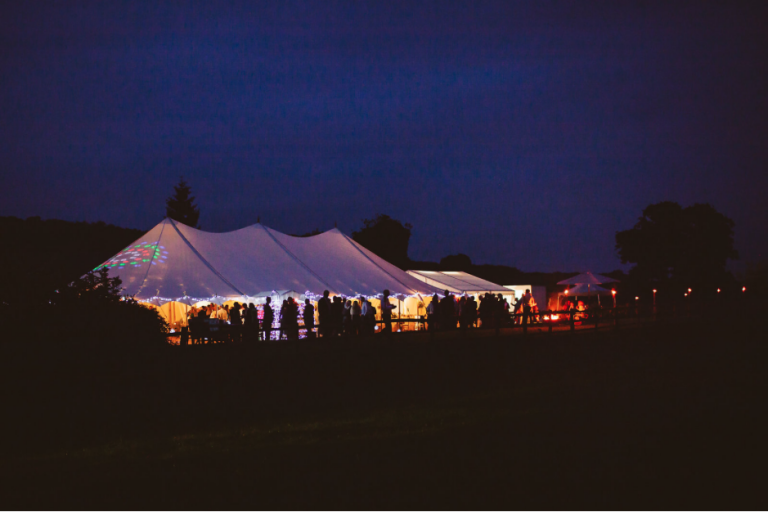 Pictures thanks to One Six Events and our clients. 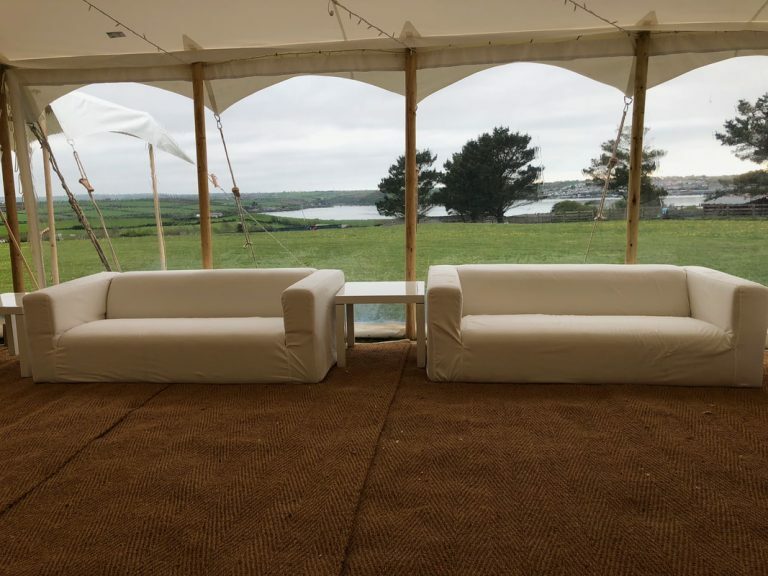 Freddie and Sarah selected a picturesque location on the North Cornish coast. 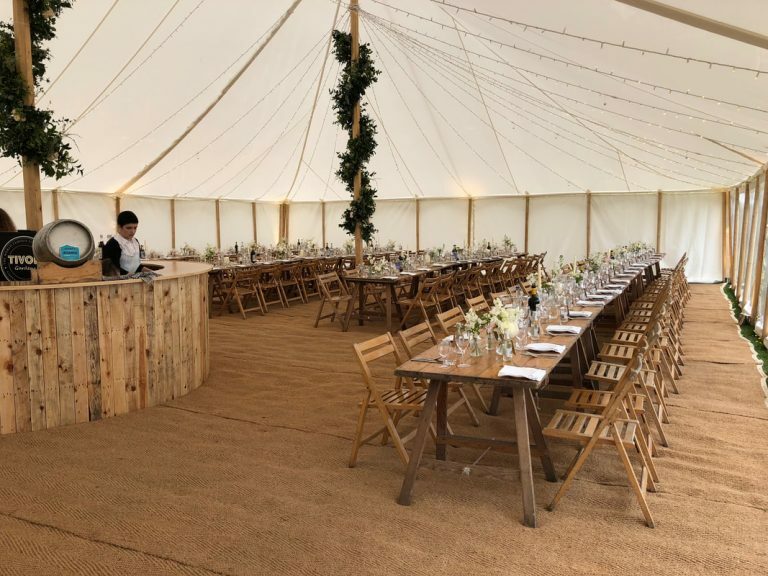 This wedding was for 150 Guests. 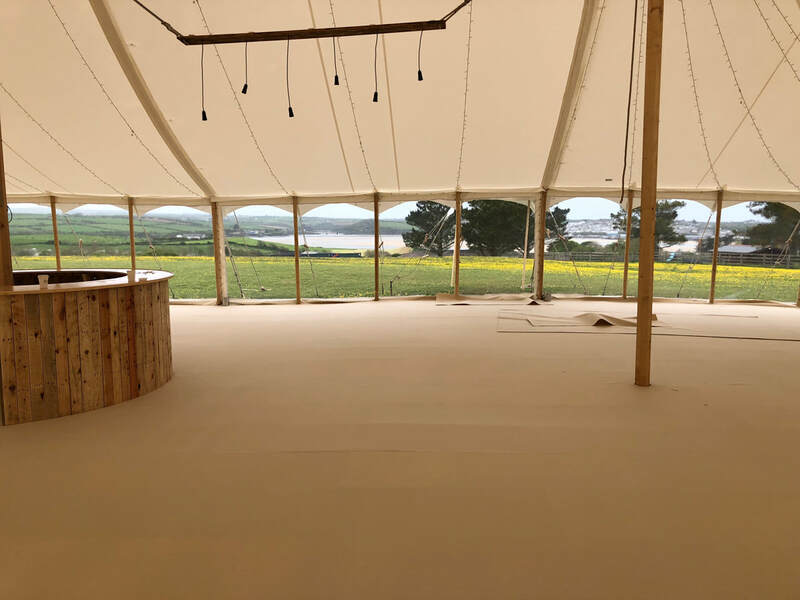 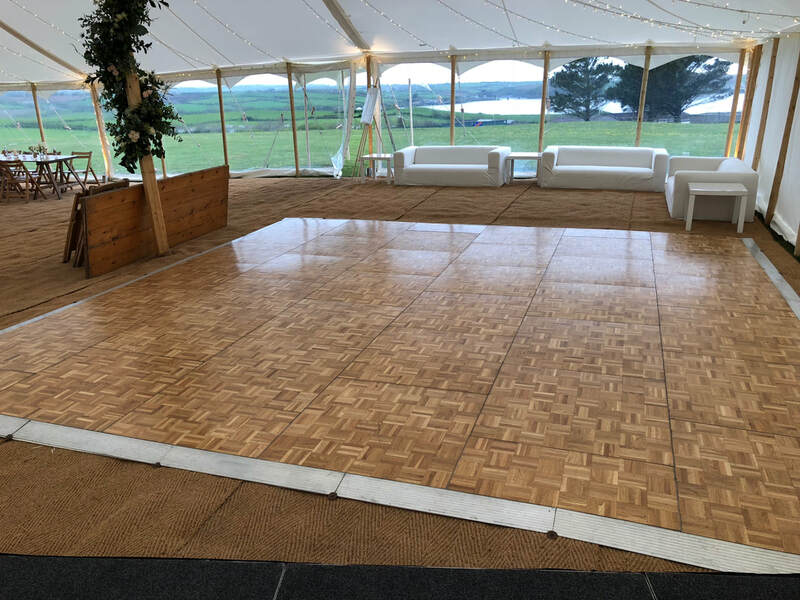 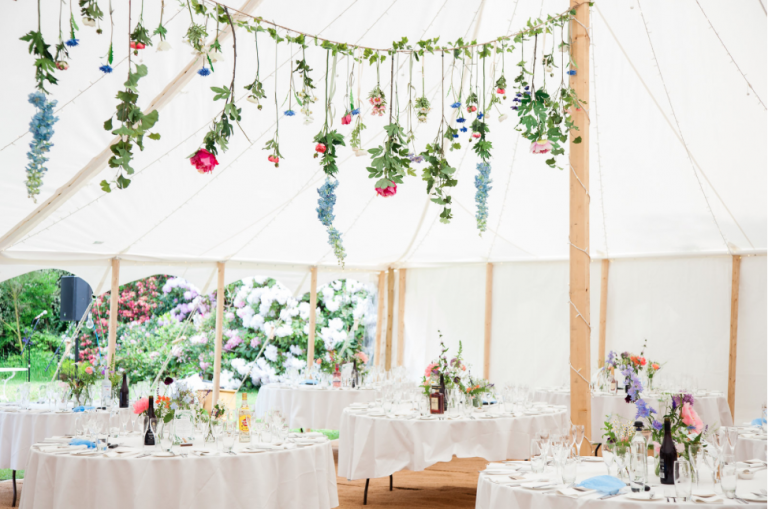 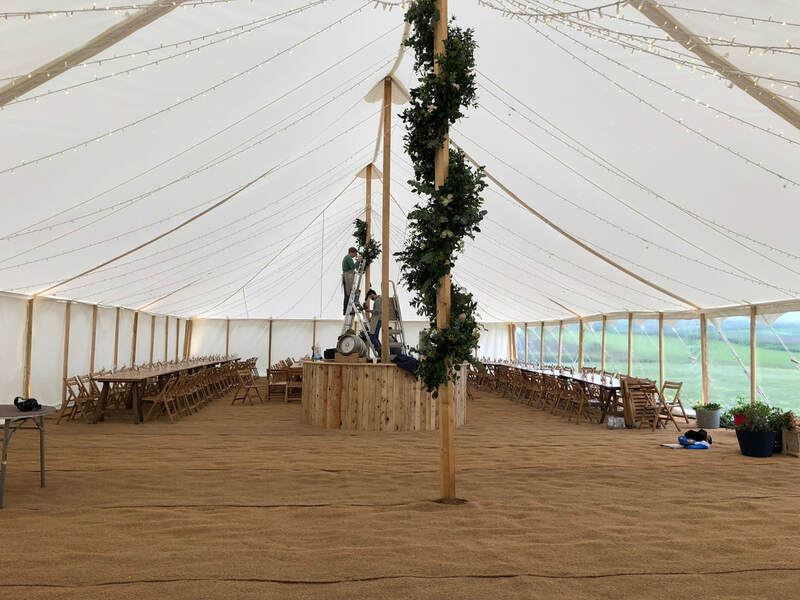 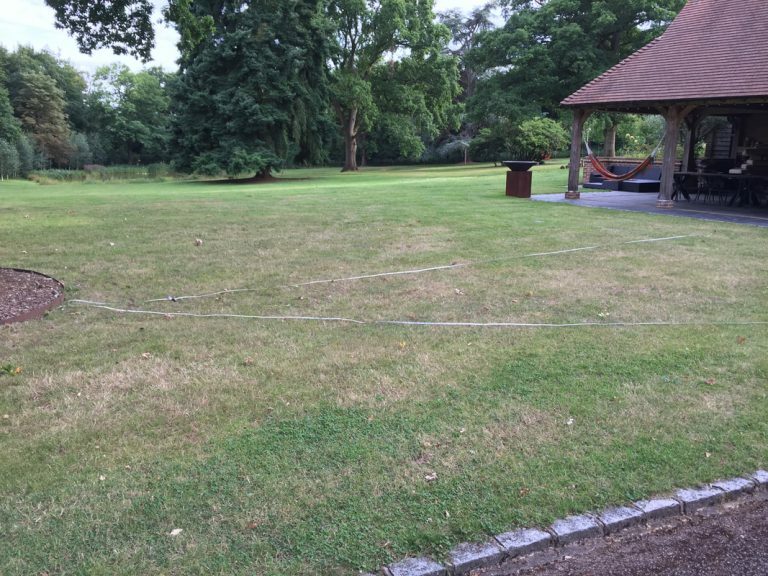 Our traditional Petal Pole marquee had raised wooden flooring with new carpet installed over. The banqueting tables with cross back chairs worked very well. 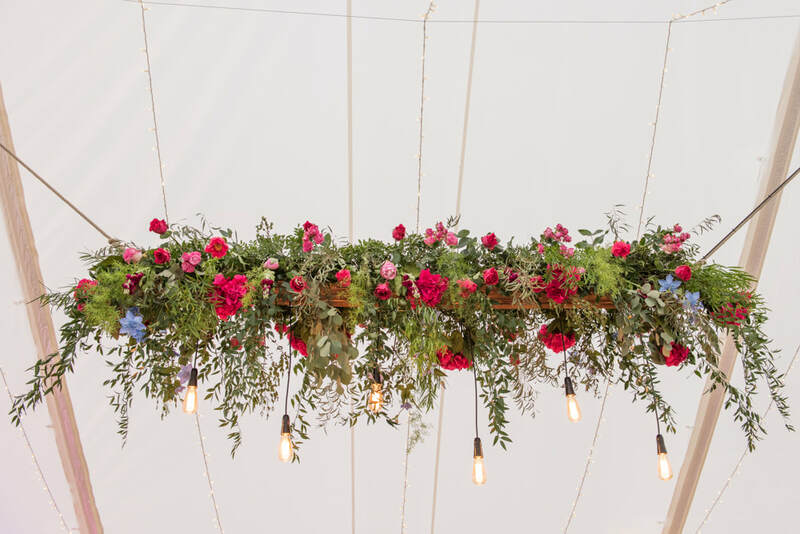 The bar was built and constructed by One Six Events, as were the flower boards with edison light bulbs installed. 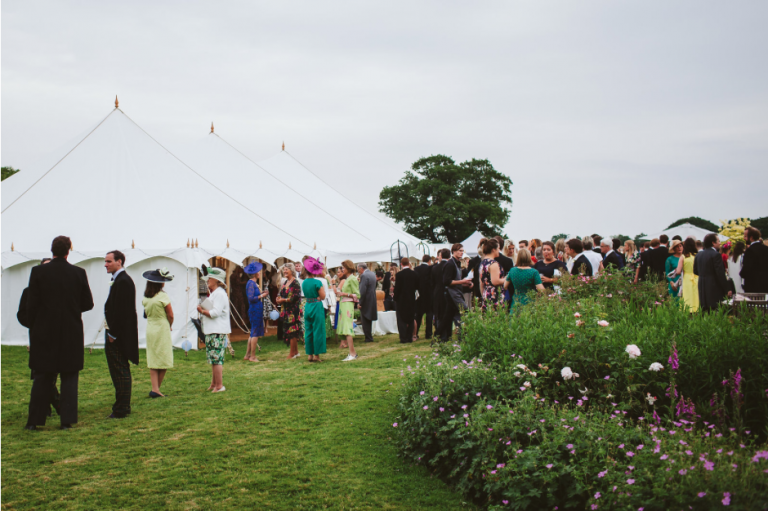 Photography by Nick Reader, catering Fee Turner and band Danni Mills Pianist. 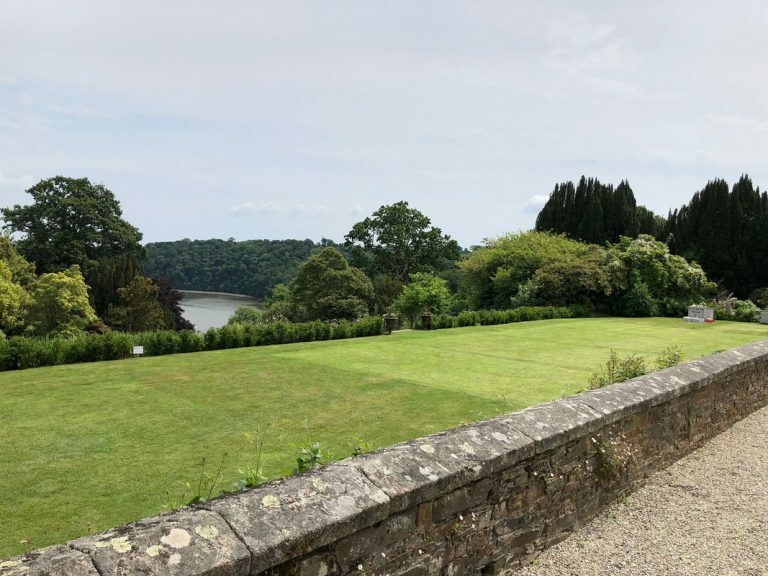 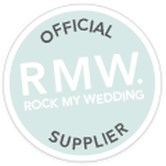 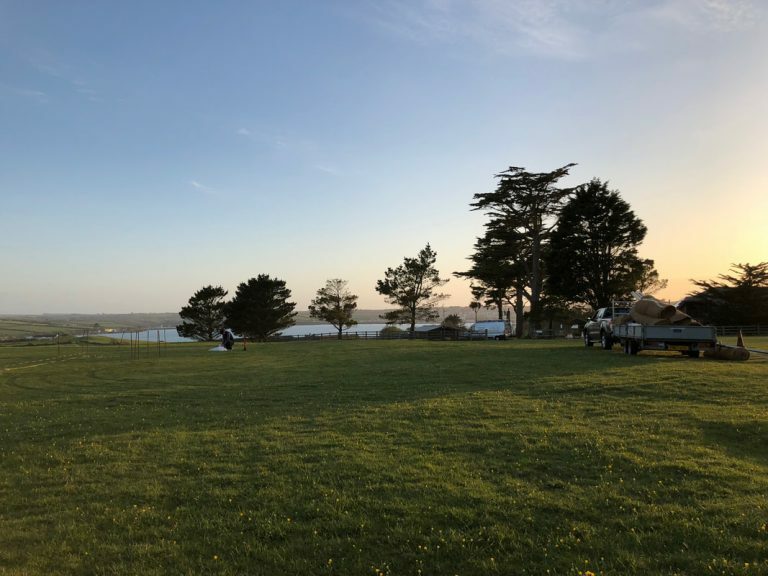 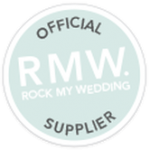 Michael and Kirsten’s wedding was set in one of the most stunning locations in the South West of England. 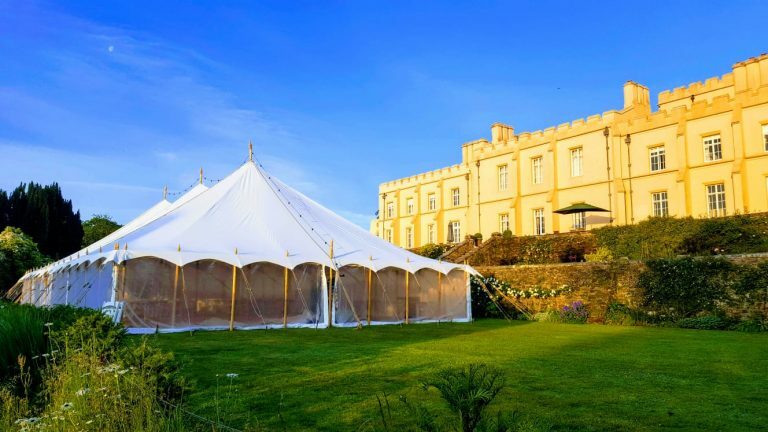 The marquee complimented the castle and the castle complimented the marquee. 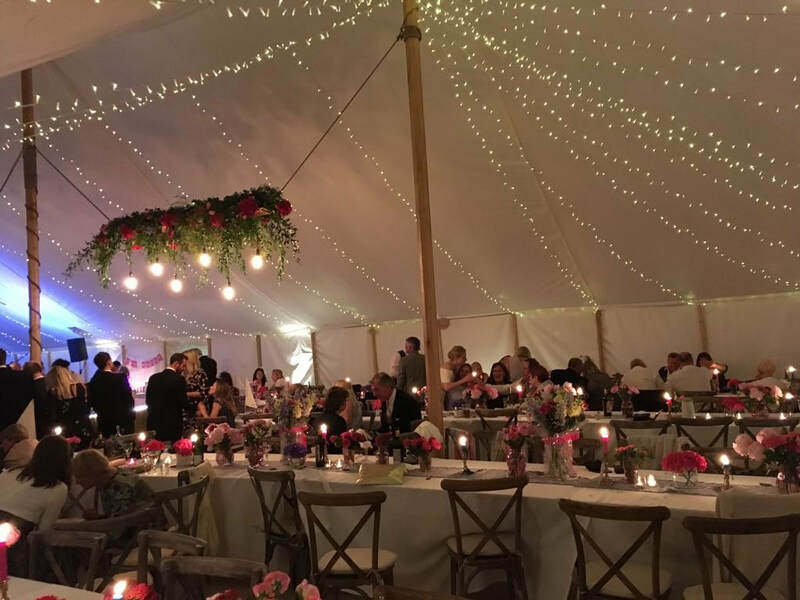 The theme of the wedding was simply stunning. 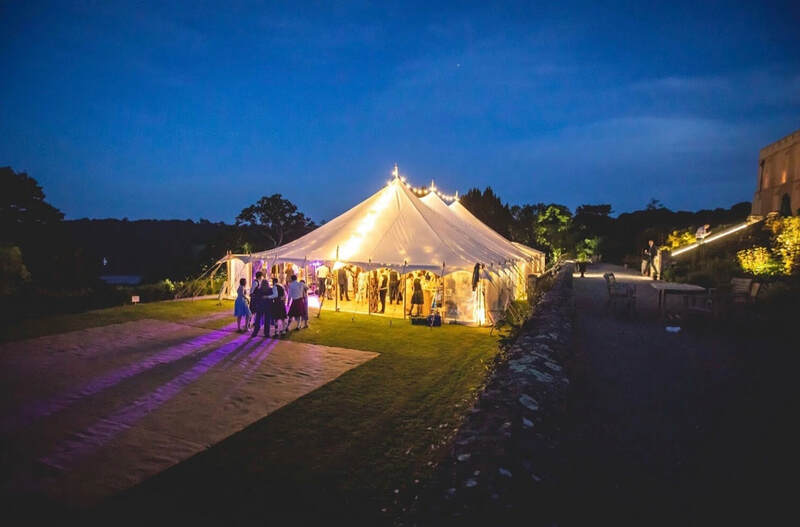 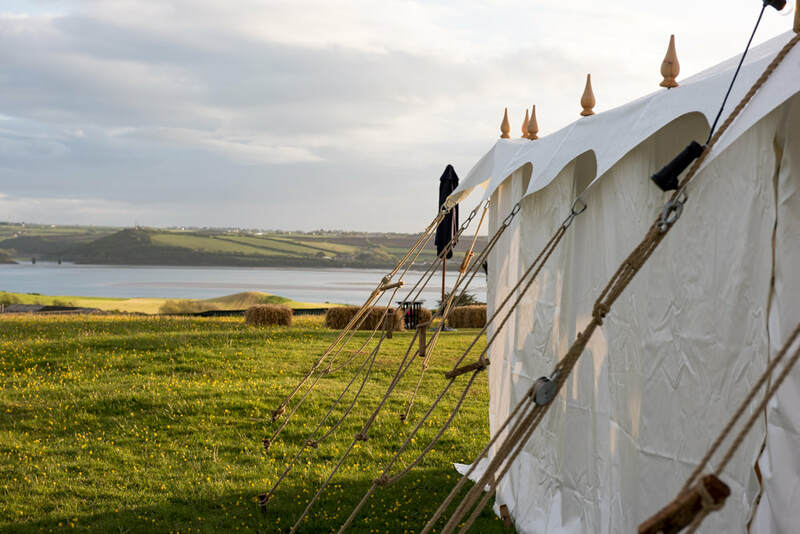 Alice and Bertie had a stunning location for their Cornish Wedding. 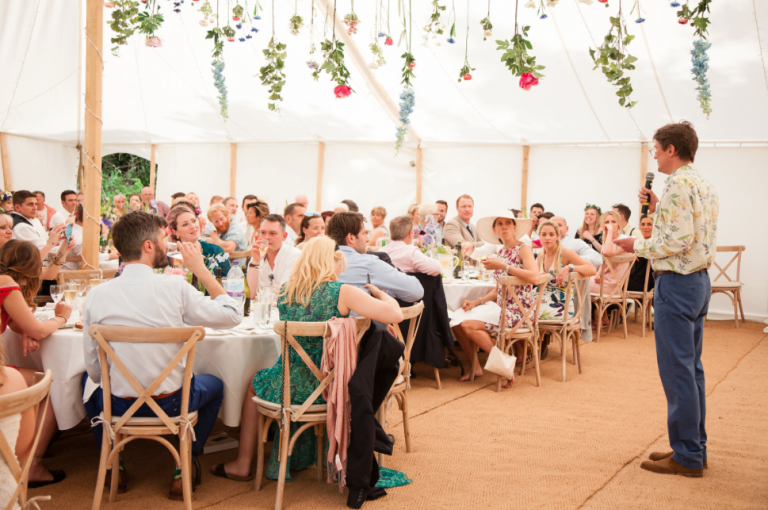 The traditional Petal Pole marquee was to hold 150 guests and had coir matting over a waterproof membrane for flooring. 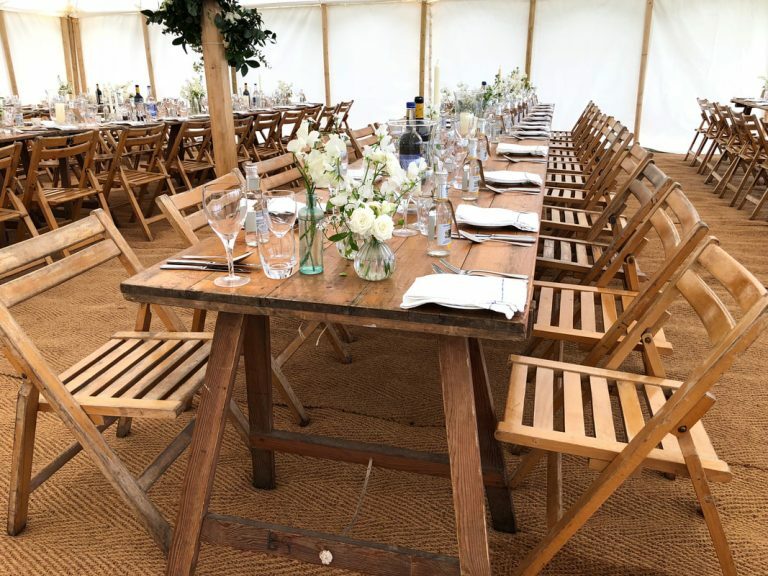 They opted for rustic banqueting trestle tables with wooden chairs. 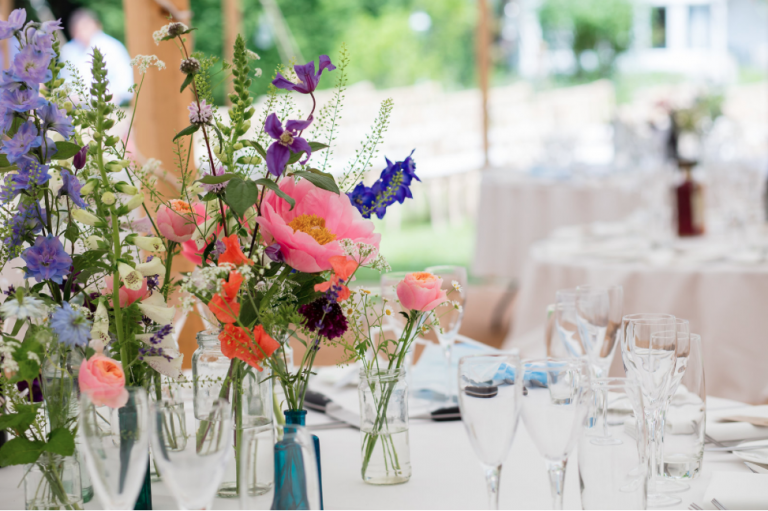 Flowers by Millie Richardson. 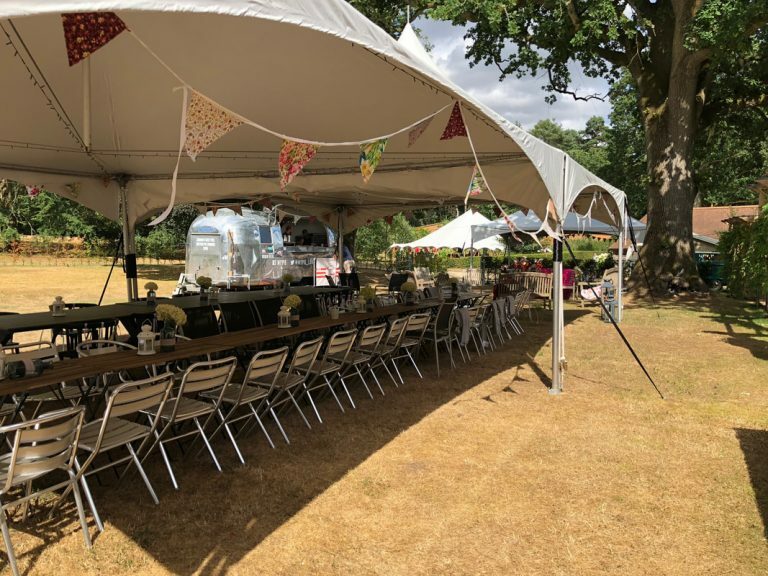 Catering by Fee Turner.